Elegant 6 Light Chrome Finish Crystal Chandelier with White Fabric Shade Medium 22" x 23"
Feminine elegance with an element of sparkle, this stunning 6-light Chandelier only uses the best quality material and workmanship ensuring a beautiful heirloom quality piece. 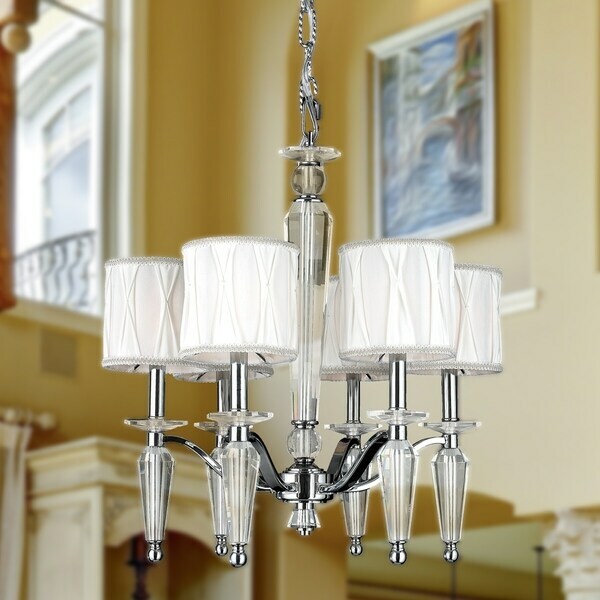 Featuring a radiant Chrome finish, beautiful fabric shade and multi-faceted crystal stem made of finely cut premium grade 30-percent full lead crystal, this chandelier will give any room sparkle and glamour. Dimensions 22.0 In. X 22.0 In. X 23.0 In.